The major factor contributing to the country’s misery is high unemployment rate. Steve Hanke, a renowned Professor of Applied Economics at Johns Hopkins University in the United States, has released his Misery Index 2018, which ranks Nigeria as the 6th most miserable nation in the world with a Misery Index score of 43.0. Hanke’s Annual Misery Index (MI) provides a ranking of the world’s saddest (and happiest) countries. According to Hanke – who is a Financial Nigeria columnist and Senior Fellow at the Cato Institute in Washington, D.C. – a misery index score for any country is simply the sum of the unemployment, inflation and bank lending rates, minus the percentage change in real GDP per capita. A higher MI score reflects higher levels of “misery”. 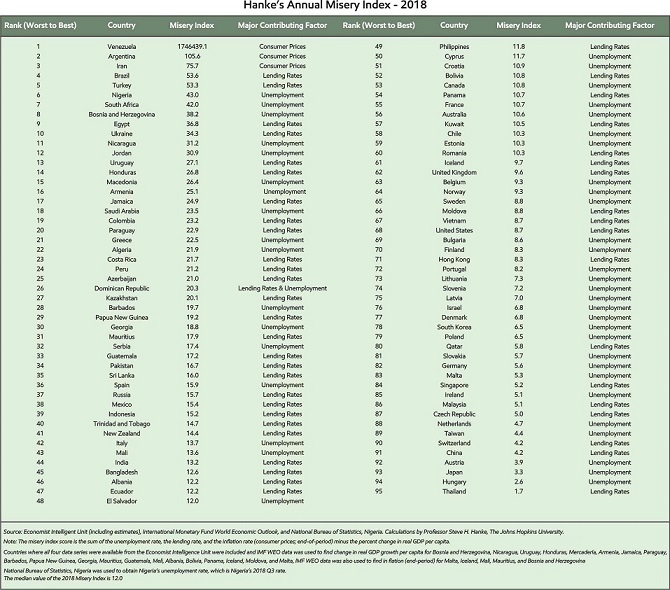 The latest report, titled, “Hanke’s Annual Misery Index 2018: The World Saddest (And Happiest) Countries,” contains MI rankings for 95 countries. Nigeria also ranked 6th on Hanke's MI 2017, although with an index score of 52.1. The major factor contributing to the country’s misery is its high unemployment rate. According to the National Bureau of Statistics (NBS), unemployment rate increased from 18.8 per cent in Q3 of 2017 to 23.1 per cent in Q3 of 2018. At the top of the ranking is Venezuela, with the highest MI score of 1,746,439.1, followed by Argentina (105.6), Iran (75.7), Brazil (53.6), and Turkey (53.3). Other countries completing the world’s top 10 most miserable countries are South Africa (7th), Bosnia and Herzegovina (8th), Egypt (9th) and Ukraine (10th). The Misery Index was first developed by American economist, Arthur Melvin Okun, in the 1960s as a way to provide President Lyndon Johnson with an easily digestible snapshot of the economy. That original index was a simple sum of a nation’s annual inflation rate and its unemployment rate. The index was later modified by several economist, first by Robert Barro of Harvard and then Hanke. According to the report, the least miserable country in the world is Thailand with the lowest MI score of 1.7. It is followed by Hungary (2.6), Japan (3.3), Austria (3.9) and China (4.2). Nigeria dropped one point on the Nielsen Consumer Confidence Index (CCI) for the fourth quarter of 2018 to 117.